It was known as Memory Place, but almost no one remembers that now. 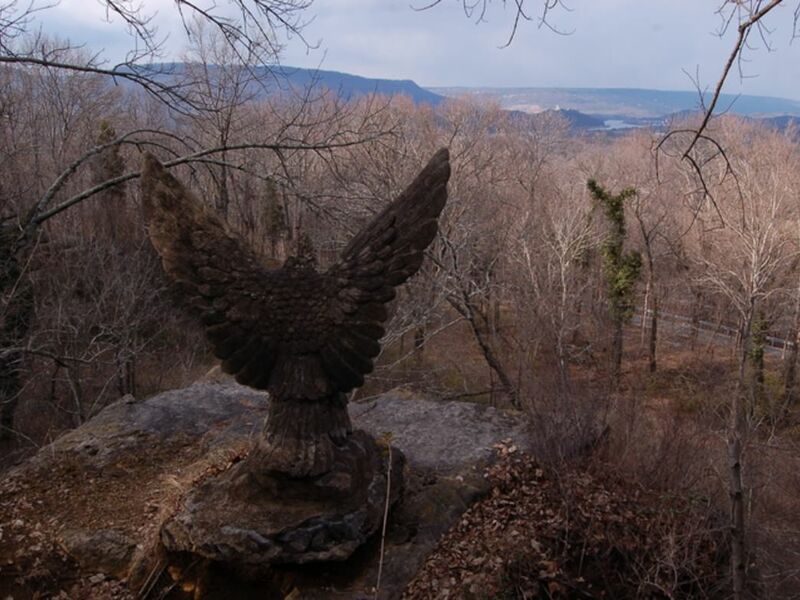 The old quarry now called the Eagle’s Nest is largely forgotten or perhaps just unnoticed, hidden by trees and overshadowed by more spectacular Lookout Mountain attractions. Just up the road, the parking lot at Ruby Falls, Chattanooga’s famous cave, is filled with vehicles, but visitors to the quarry are rare. It’s not often you hear about Milton Ochs, either. Milton Ochs may have done more than any other person to preserve thousands of acres on the north end of Lookout Mountain, but like the quarry, he was constantly in the shadow of others—specifically his famously successful brother, Adolph. If you google “Milton Ochs Chattanooga” you’ll get hundreds of hits for Adolph, crowding out the very few for Milton. Check Wikipedia and you’ll find entries for Adolph and another brother, George, but no page for Milton. 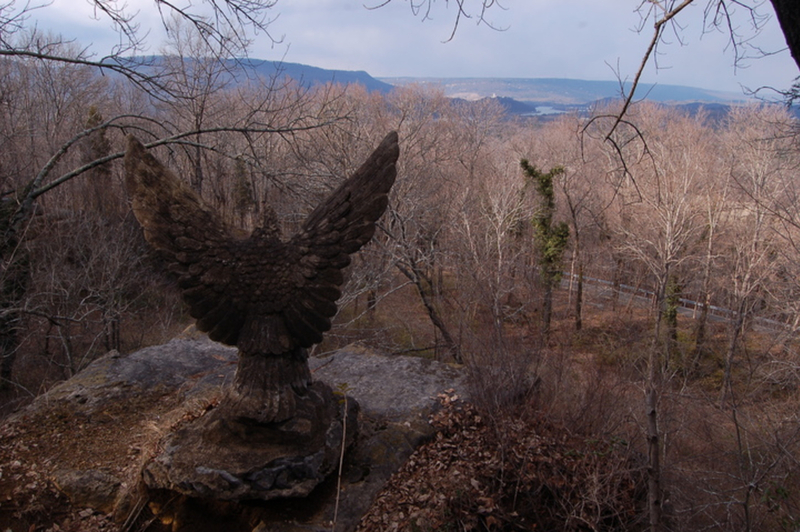 Adolph Ochs, who at age 20 had borrowed $250 to purchase The Chattanooga Times and went on to become the publisher of The New York Times , has long been given credit for turning much of the north end of Lookout Mountain into a park for the public’s use. In 1887, Adolph was among those who purchased and reopened 16 acres at Point Park from Harriett Whiteside (a woman with a fascinating tale of her own) after she had fenced off the property. 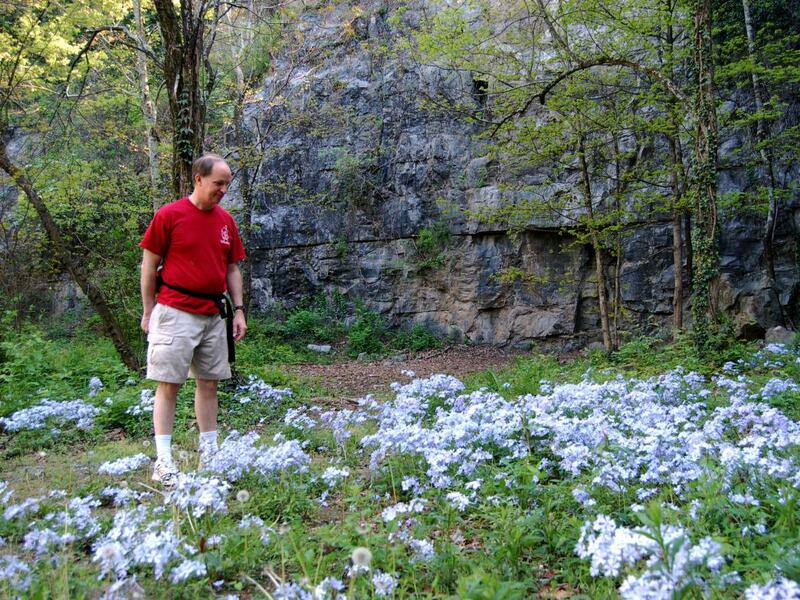 By the 1920s, Adolph lived in New York but during visits to Chattanooga began promoting the idea of the “Hanging Gardens of Lookout.” While the western slopes were to be preserved as forest, landscaped terraces would stretch along the eastern face from what’s now Rock City to the Cravens House. There was talk of pumping water up from the Tennessee River to create cascades down the bluffs above. It would rival, Adolph Ochs said, the legendary Hanging Gardens of Babylon and become a modern wonder of the world. The Chattanooga Lookout Mountain Park Association was formed in 1925 to begin purchasing land, which would, in 1934, be turned over to the federal government to become a unit of Chickamauga National Military Park. Today, broad sandstone steps still lead up into the woods from Scenic Highway to the weathered limestone amphitheater. Five foot tall statues of eagles, one now headless and the other almost as badly worn, stare down from the corners of the upper walls. Vines and trees add to the air of mystery and neglect. Below, at the top of another set of broad steps on the floor of the quarry, are low stone walls that surround a small pool that was to be filled with water lilies and graced by a fountain. Dry and overgrown, the pool now resembles a sort of sunken altar. Nearby in the woods a jumble of rocks is all that remains of a bust of Shakespeare that was intended to be the first of many statues of inspiring figures and prominent Chattanoogans, people to be remembered. 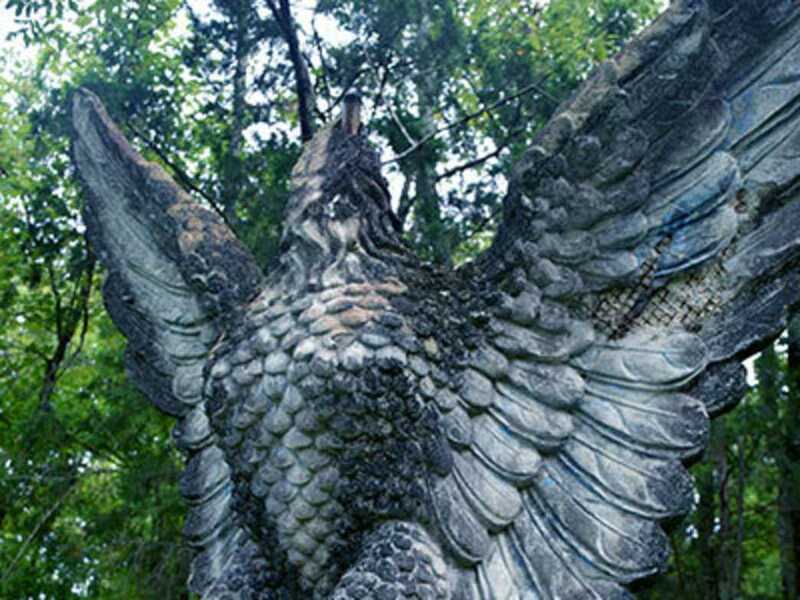 The imposing eagles that gave the quarry its modern name were not without controversy. Created by sculptor Spefano Giuliano, they were painted a bold blue. It may be no coincidence that a strikingly similar blue eagle was the symbol for Roosevelt’s National Industrial Recovery Act, part of the New Deal that attempted to regulate industry and emphasize fair labor practices. Today, there is no interpretive signage, no explanation of the eagles—just the oddity of their presence combined with the other ruins. Occasionally someone will do some clearing and repair of the waterbars and steps on the trail that surrounds the quarry, but for the most part nature is working relentlessly to reclaim the site, which only adds to the mystery. Was it Milton Och’s idea to landscape and open the sides of the mountain to the public, or was he simply a dutiful brother carrying out Adolph’s wishes? Milton gave the credit to his brother, telling Congress that Adolph “conceived it, planned it, and financed it,” but given his brother’s stature it would have been good strategy to make that claim. 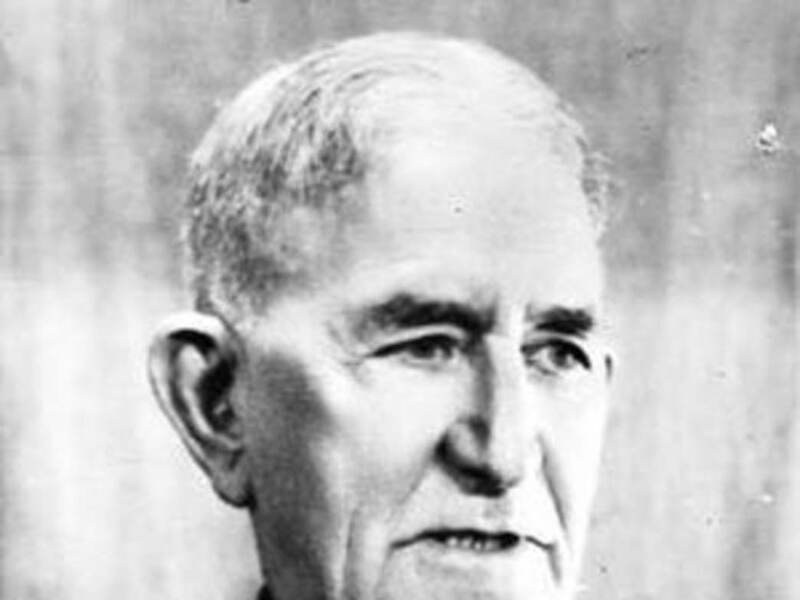 Regardless of who got the credit, it was Milton Ochs who chaired committees, oversaw land purchases, and directed the tremendous undertaking that today allows us to run or hike some 40 miles of trail, climb at Sunset Rock, or mountain bike the Upper Truck Trail. Although he did not equal the fame of his brother, Milton Ochs spent a lifetime serving others. He attended the funerals of people he had never met, wrote personal notes to the elderly. He led flood relief, food, and clothing drives, as well as efforts to build highways and erect buildings and monuments. In later years, Milton wrote a daily column in The Chattanooga Times called “Looking Backward,” so it is ironic that when we look back today, we don’t see much of him. There is a humble majesty to that mysterious old quarry with its crumbling eagles. In that place, as much as anywhere else in the park, is a legacy. “May sunshine from all and for all be our motto,” Milton Ochs wrote. 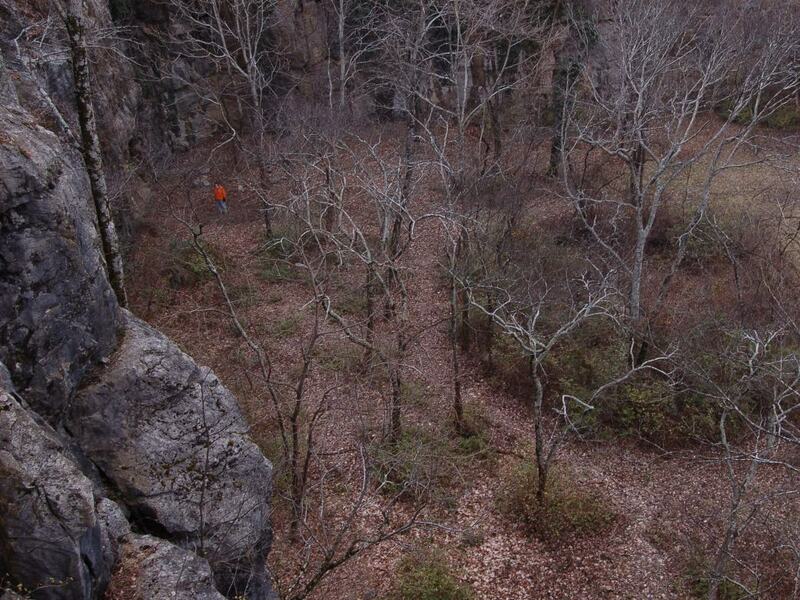 The Eagles Nest is just down Scenic Highway from Ruby Falls. It is possible for one or two vehicles to park on the highway, where a trail leads into the bottom of the quarry. Much better parking is available above by driving through the upper Ruby Falls parking lot to the far northern end. The gravel parking lot on top is also a good place to access the Guild/Hardy Trail , which follows the bed of the old broad gauge railroad from St. Elmo past the Cravens House nearly to the top of the mountain. Perhaps the most common visitors to the quarry today are cavers, rescue squads, and others wishing to practice rope technique. Please do not climb or do ropework without proper training. Be cautious around the edges and keep a close eye on children. The area closes at sunset.